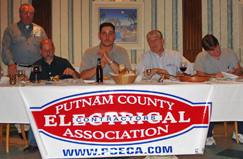 The Putnam Country Contractors Association meets on a monthly basis to educate it’s members, contractors, and guests about codes, safety, public relations and the best way to educate customers about the need to use licensed electrical contractor. The members meet for a social and organized educational meeting to network with vendors, electrical inspectors, and other contractors. We are a group that pays dues to the organization for the betterment of our trade. We are not required to do this, we all do it to go above and beyond the bare minimum of what is required. We want to be the best in the area at what we do so we take time from our families to meet together to find ways to better ourselves, our trade and the customers we serve. Our gold is education! NYS Electric & Gas Corp.
Putnam County Electrical Contractors Association is a not-for-profit trade association. Our association was formed in 1980 to establish and promote high standards for knowledge, safety and value in electrical service, for the benefit of the people, institutions and businesses of Putnam County. Fill out our member application and join us today! Copyright © 2019 The Putnam County Electrical Contractors Association. All rights reserved.